I have to admit that this one took me awhile to get into. I didn’t love it at first. However, I think it has a lot of potential! My friend told me I have to read book #2 and that I’ll for sure be hooked after I read that one. I’ll let you know. I do think it’s an interesting and unique concept, and I’m interested to see what happens to Kendra and Seth later on in the series. 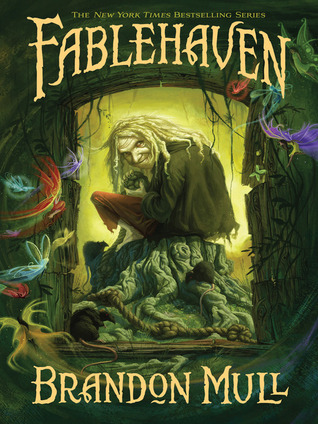 “For centuries mystical creatures were gathered into a hidden refuge called Fablehaven to prevent their extinction. The sanctuary is one of the last strongholds of true magic. Enchanting? Absolutely. Exciting? You bet. Safe? Well, actually, quite the opposite…Kendra and her brother, Seth, have no idea that their grandfather is the current caretaker of Fablehaven. I liked this book, but I didn’t love it. It was good and entertaining, but it didn’t capture me from the beginning. It didn’t seem “real,” which is funny because it’s fantasy, but that’s how I felt. It was good, clean reading, and it would be a good read-aloud for younger children. I do know some people that LOVED this book, so it may just be me. I think I will read the rest of the series because I know my children will want to read them and I like to preview books before they read them. I would recommend it for when you want to read a book and don’t really want to think, just be entertained. It is an interesting concept that fantastical beings are all around us, but we can’t see them. We see butterflies instead of fairies, goats instead of satyrs, and so forth. Hmmm…what else is out there that we’re missing out on? Kendra and Seth are good characters, each with their own strengths and weaknesses. I definitely relate more to Kendra because she is a rule follower like me. The character development is well done, and I like the uniqueness of the story. Age Recommendation: Middle Graders (4th-6th) and up. It would be a fun read-aloud for 2nd-3rd graders too. This book review was first published on 4/5/10. Updated on 10/22/18.